NEW YORK, New York — The Hayastan All-Armenian Fund has completed a major renovation project at the Maternity Hospital of Abovyan, a city in Armenia’s Kotayk Region. The critically needed initiative was made possible by the Fund’s Montreal affiliate, through a contribution by Canadian-Armenian benefactors Mr. and Mrs. Vrej and Imasdouhi Nigoghossian. Their donation was made in 2009 in memory of their parents, Kalousd and Veronica Vartanian, as well as a sister, Filor Vartanian. The completion of the renovation project was celebrated with an opening ceremony held on September 18 at the site. Dignitaries and guests attending the event included Ara Vardanyan, executive director of the Hayastan All-Armenian Fund; Alexander Ghukasyan, Armenia’s deputy minister of health; Karapet Guloyan, mayor of Abovyan, and Kevork Keorhadjian, representative of Mr. and Mrs. Nigoghossian. The refurbished Delivery Ward was blessed by Father Smbat Sargsyan, pastor of the nearly village of Arinj, who conveyed his wish that numerous healthy babies be delivered at the facility for years to come. The hospital has undergone no renovation since its establishment in 1985. In recent years the need for a thorough facelift of the Obstetrics Department in particular has become an issue of increasing urgency. The department includes the surgery wing, delivery rooms, and a unit for monitoring infants born prematurely. The Hayastan All-Armenian Fund project comprised the complete renovation of the 660-square-meter Delivery Ward, located on the third floor of the hospital. In her remarks during the opening ceremony, Dr. Larissa Madoyan, director of the Maternity Hospital, thanked the Fund for transforming the Delivery Ward into a state-of-the-art facility. “By totally renovating a facility where our newborns come into being, the Hayastan All-Armenian Fund has carried out an endeavor of incalculable importance,” she said. Dr. Madoyan also informed the attendees that, compared to 2009, the number of births at the hospital has increased by 50 this year. The Abovyan Maternity Hospital will see further improvements in January and February 2011, when a World Bank project will enable the Health Ministry of Armenia to provide the medical center with up-to-date equipment as well as furniture. Based on the latest statistics, 1,500 deliveries and 350 surgical procedures per year are performed at the hospital. In addition, 1,700 expectant mothers receive consultation and some 3,300 women are provided with outpatient care. The hospital employs 35 physicians and a support staff of 80. As he addressed the attendees during the opening reception, the Fund’s Ara Vardanyan had high praise for benefactors who support the development and growth of the homeland’s healthcare sector. “All of our benefactors who finance healthcare projects are very much aware of the fact that the well-being and progress of our nation depend, first and foremost, on the health of its citizens,” he said. 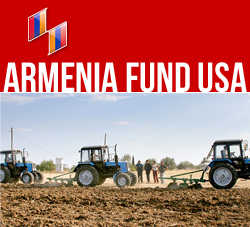 The Hayastan All-Armenian Fund’s Montreal affiliate continues to distinguish itself with its support of vital development projects across Armenia and Artsakh. During the affiliate’s October 2009 fundraising dinner, the Armenian community of Montreal once again rose to the occasion as it raised funds for two major initiatives. That night, Mr. and Mrs. Vrej and Imasdouhi Nigoghossian made their donation for the renovation of the Abovyan Maternity Hospital, while funds raised through the contributions of 200 other attendees were earmarked for the renovation of the community center of Artsni, a village in Armenia’s Lori Region, a project completed this summer.